On Friday, the folks at the Schiele Museum in Gastonia, North Carolina, got a taste of the "Tiny House Bump." Tiny houses are popular. And no, you will never hear me refer to them as "the next big thing." Because they are popular, when non-tiny house programming brings the topic of tiny houses to the table, it is exceptionally well received. The turn out for our talk at the Science Cafe on Friday, April 10th, was fantastic. The event featured snacks and beverages as well as some games. We played Tiny House Trivia, which was really environmental trivia, and built buildings out of marshmallows. Then Matt and I presented a slideshow of our tiny house that included the philosophy of tiny house living, the environmental impact, and some basics on building. We had a fantastic time and would like to thank Sara and the team at the Schiele Museum for putting the Science Cafe programming together. Our next adventure is Portland Oregon for the 2015 Tiny House Conference. We leave on Thursday. Our first night, we are staying at the Tiny House Hotel and are super excited about that. 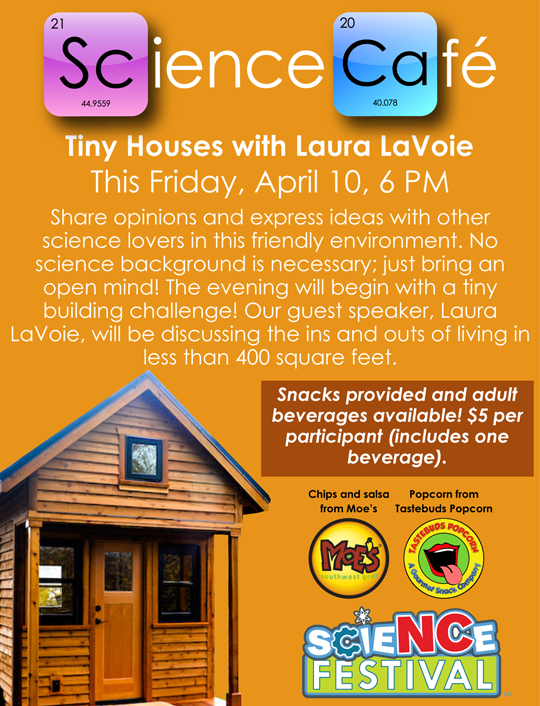 Then, on Friday, we convene with the other tiny house folks and speakers and get this party started right! Stay tuned for more about the Tiny House Conference and our adventures in Portland.